More than 1,800 students arrived with resumes in hand to connect directly with top global and local companies, government agencies, and nonprofit organizations at UMBC’s Fall Career and Internship Fair. Recruiters from 140 employers were drawn to UMBC’s largest annual recruiting event to share opportunities with students across all colleges and programs. In the days before and after the fair, several organizations—such as Google—also made special pitches to UMBC students. Google’s visit was part of a larger trend at the university. In the fall semester alone, more than twenty Fortune 500 companies will visit campus through the UMBC Career Center to recruit students for internship and job opportunities. This list includes household names like Google, Facebook, ExxonMobil, Microsoft, Northrop Grumman, Morgan Stanley, Wells Fargo, General Motors, and Goldman Sachs. Strong local employers visiting campus to recruit UMBC talent include McCormick, T. Rowe Price, Legg Mason, Big Huge Games, and the Johns Hopkins University Applied Physics Lab, among others. During Google’s campus visit, UMBC students had several opportunities to connect with recruiters from the company. 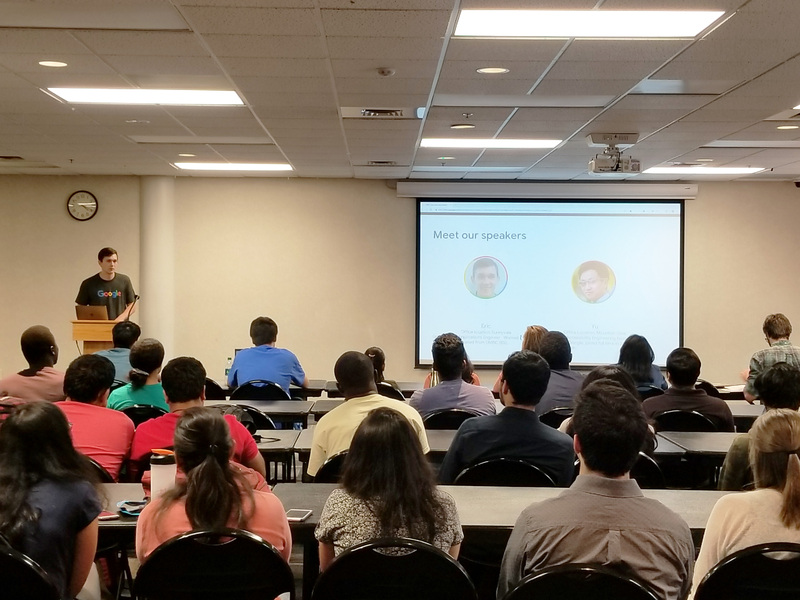 At their information session, Google provided helpful tips on applying for internships and jobs with the company. Later in the week, Google representatives met with students to answer specific questions about working at Google, offered a tech talk, and hosted a coding competition for students. Students filled the room during the tech talk with Google. Photo courtesy of Dustin Eby, program assistant in UMBC’s Career Center. Several current students completed internships at the company last summer, including William Gao ‘19, computer science; Deepika Rajani ‘19, computer science; and Ashley Copenhaver ‘19, mathematics, who has completed multiple Google internships. “Over the course of my internships with Google,” Copenhaver says, “the most unique aspect I noticed was that Google promotes a constant learning environment. I collaborated with people not only in my office, but also across the globe, and there was never a meeting that I walked out of without learning something new.” She hopes to intern again with the company in summer 2019. Students seeking job and internship opportunities can follow the Career Center through myUMBC, utilize the UMBCworks jobs database, and can also take advantage of personalized coaching and support provided by UMBC Career Center staff. Employers interested in recruiting at UMBC can contact careers@umbc.edu for assistance. Banner image: Students at a Career and Internship Fair in 2017. Photo by Marlayna Demond ’11 for UMBC.